Food storage is important. It extends the life of your food, whether you're freezing meats, storing leftovers, or marinating dinner. You want your food storage products to be durable, safe, and effective. These are traits that help ensure that your food remains fresh and safe to eat. 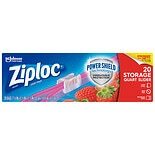 Ziploc understands these needs. It's why the brand is a leader in the food storage industry. Here at Walgreens, you can find a variety of Ziploc bags for all of your food storage needs. 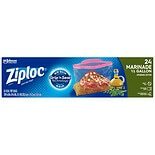 Stock your kitchen cabinet with Ziploc bags so that you're prepared the next time you need to store food. 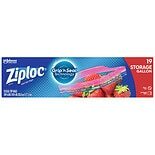 Ziploc bags are designed with a variety of needs in mind so many different styles are available. Matching your needs to the right bag type is the first step in making food storage and preparation an easier task. Plastic storage bags come in a number of sizes. 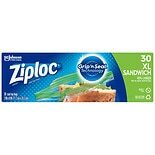 Smaller bags are perfect for storing sandwiches in your lunchbox. Quart- and gallon-sized bags can hold even more food. These big sizes work well for storing leftovers or packing up food for a picnic. 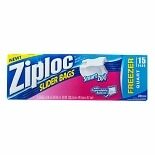 Freezer bags can hold up to two gallons. 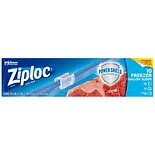 They are durable enough to withstand cold and prevent freezer burn. 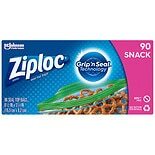 No matter the size of Ziploc bag you choose, you can enjoy a number of features that protect your food and extend its freshness. A double zipper ensures that your bag closes securely. This helps to lock in freshness. 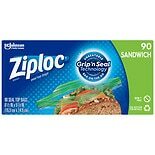 The Smart Zip seal allows you to both see and feel the seal forming as it blocks out air. A newly redesigned bag film also blocks out air which further protects your food from early spoilage.